Well, here I am: all four of my children are at school. And it’s FULL ON. 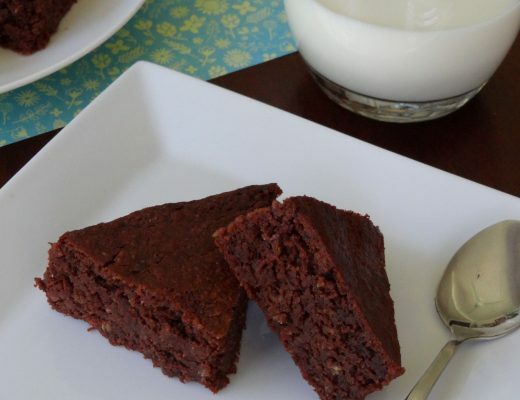 Sport days, music days, library days, basketball practice, concert band ensemble, strings ensemble, cello lessons, piano lessons, clarinet lessons, homework, newsletters, assignments, oral preparation, home readers, sight words…and lunches. As I said, there are four of them at school this year, and they all have something different on each day. Sometimes, I feel like I need a live in secretary to keep track of everything! My goal is to set things up so my children can be as independent as possible. This comes in three parts: the first is to establish micro organisational systems that work, the second is to teach the how and why, and thirdly: the learning of responsibility through natural consequences. I focus on organisational systems rather than jobs in the home, because I figure the former will become a life skill that can be applied to various situations. The hard part is sustaining and finding out what works (really works) in our home. There’s a bit of trial and error here. Routine is fabulous, but I do find I need to have flexibility when it comes to organisational systems, because our family changes and grows. For the first step of the process, I establish micro organisational systems which I then teach the kids so they can be responsibile for THEIR OWN STUFF. This is my ultimate goal. It’s not to have everything perfect, or even have everything the way I like it, but rather to empower the kids to be able to organise themselves. I need this to stay sane, because with four kids to organise, I can’t micro manage everyone on a daily basis (plus I believe it’s important that children are as independent as possible). My children need to wear two different shoes to school, depending on the day: formal shoes and sport shoes. They also need to have sport socks with the sport shoes, and formal socks with the formal shoes. It drives me nuts. We have a shoe rack at the back door and the children put their shoes on the rack, because then they always know where to find them (plus it keeps the clutter out of the bedrooms). 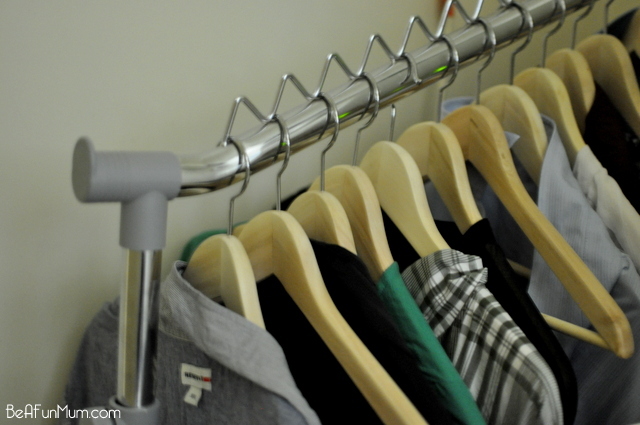 We also use this rack to hang hats and bags. All my children wear different sized socks, and it’s important for me to easily (and quickly) sort them. I use a Sharpie Fabric Pen (in four different colours) to mark a dot near the toe section of each sock. I keep clean school socks in a box in the laundry, rather than in the respective child’s room. I know there are fancy plastic boxes for storage around, but currently, I use an empty shoe boxes in the laundry for the clean socks. 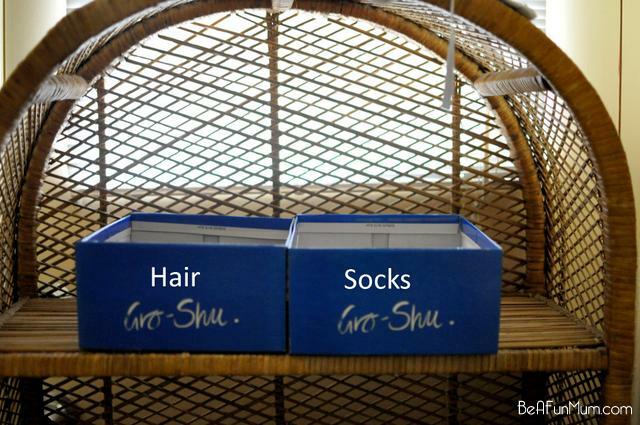 I use one box for socks, and the other for school hair bands. Having three girls means we have a variety of school hair bands and ribbons, which I keep in the laundry, separate from our regular pretty stash. This makes it quick to find things in the morning. 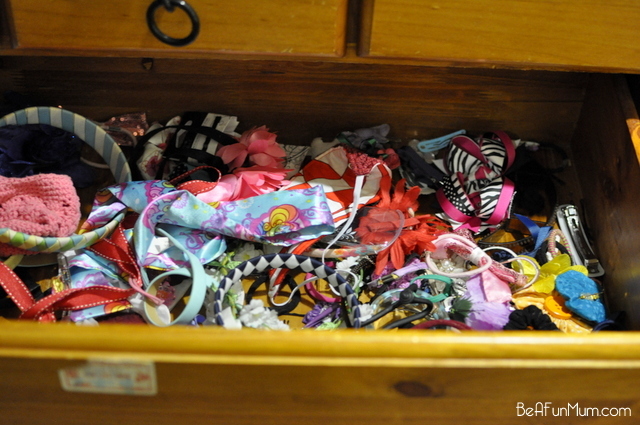 The pretty hair things are kept in one big communal drawer in one of the bedrooms. I don’t section them, or keep them neat, as it’s easier to just have a dedicated drawer to throw them all in. Organised chaos, I call it. I wash, and then immediately hang the uniforms on a hanger on a drying rack I purchased from Howards Storage World. The children help themselves from the drying rack, and because I hang the uniforms while they are still wet, they don’t need ironing. I explained this system a little more in depth last year, so if you’re interested, you can read the post here: The Epic Job of Organising a Family. To organise family life, I use the combination of a year planner and my iPhone. 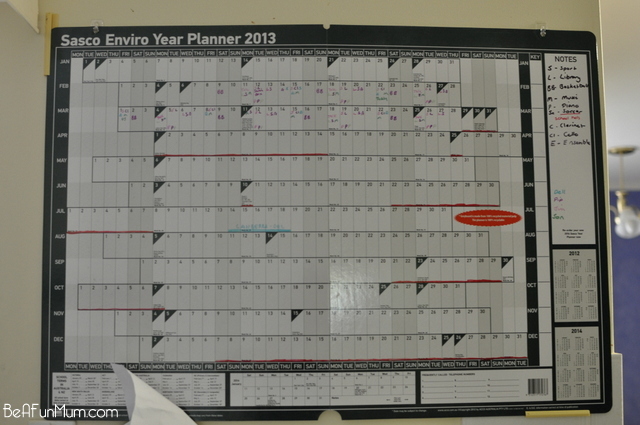 The year planner is a reference for the entire family. 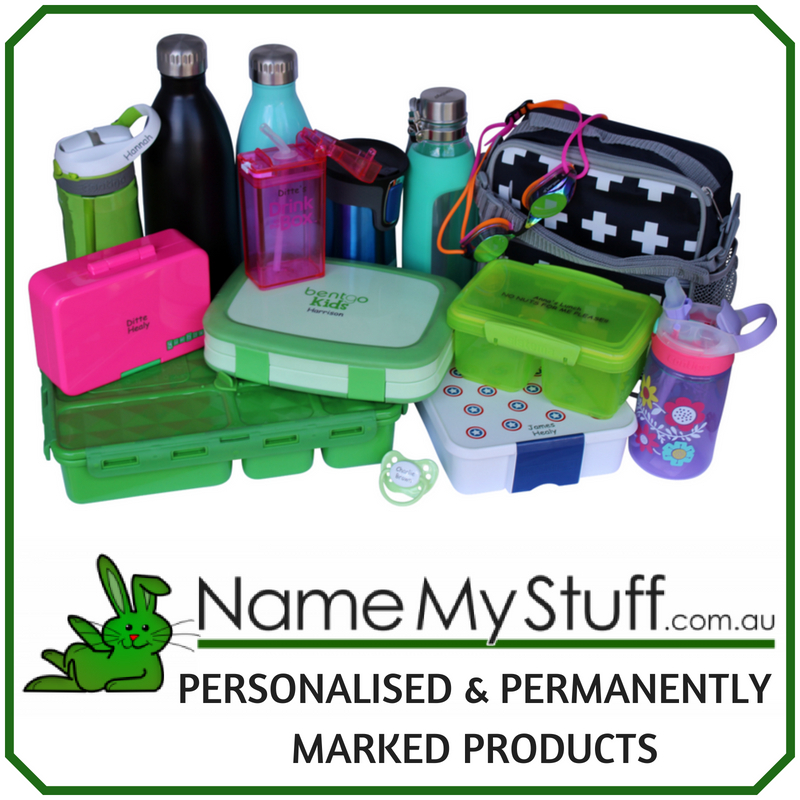 I use it for the routine school, school and family holidays, plus things like parties or miscellaneous school events. My iPhone holds appointments for the children, and my own schedule with times, addresses and other detailed information. I use a code system as a reference for myself and the children. This is how it works: I use a different permanent market colour for each child, then, abbreviations for each event, like L for Library day. So you can see in the red week highlighted below, on the 18th, Jim (in pink) has a talk, Son (in Green) has music and Library, and Pip (in Purple), will need to be in sports uniform. 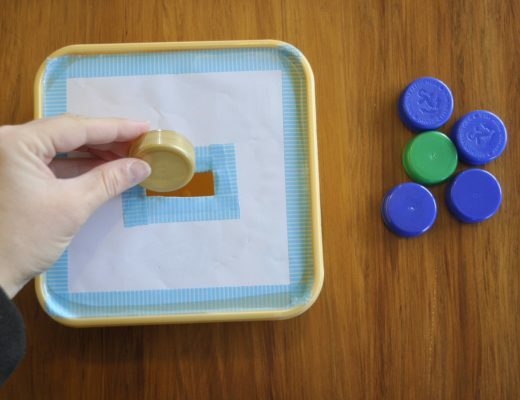 This way, the children can look at the calendar each morning and find what they have on (with no input from me). If one of my children have something on the weekend, like a birthday party, then I will write something like ‘Party’ in the child’s respective colour, and the details, like time and address, will be on my iPhone. I’ve tried quite a few systems but this works best for the family and myself. Hats go on the hooks on the shoe rack. Bags also go on the shoe rack. The shoe rack becomes very much of a school station. Lunchboxes goes on the bench and any school notes. The younger two children (5 and 7) also put their homework on the bench for us to look at later (my older children — 9 and 11 — are at the point now where they organise and do their own homework without much, if any, supervision). I’ve established these micro systems for my kids in an effort to help them help themselves, but if they want to deviate, that’s fine by me, as long as it WORKS. For example, one of my daughters prefers to keep her hat on a hook in her room, rather than on the rack outside. Also, my eldest children tend to keep their bag in their room (as they have more home work at that sort of thing) rather than on the rack. As the kids get older, I need to establish less and less systems for them as they work out their own. It takes a good month to establish all these micro routines successfully. I don’t just ask the kids to do it, I tell them why. Son, remember to put your shoes on the rack, as soon as you take them off…every time. Because then you know exactly where they are in the morning or whenever you need them. I find that natural consequences are one of the best way for kids to learn responsibility. So, for example, if my daughter forgets her hat, then she won’t be able to play at school. Or if my son forgets to put his shoes on the rack, and then is rushing around in the morning stressed, trying to find the shoes, I can put it back on him: it’s his responsibility to look after his property; I’ve patiently taught him how and why to do it, and I can point out the consequences of his choices. Rather than nagging the kids all the time, I let the natural consequences run their course. This is something I have to consciously allow to happen, especially as the children get older, because it’s really hard to do sometimes. I want the kids to see me taking responsibility too, and how in a family, we all have a part to play. So, for example, in terms of school, it’s my current responsibility to have the uniforms washed and do the lunches. Now, there have been times when I haven’t been organised myself, for whatever reason, and say I’m late to do the lunchboxes, and then we are late getting in the car, I will apologise to the kids. Like every aspect of parenting, it’s time, time, time. Nothing happens quickly. It’s years and years of nurturing, communication, and encouragement. It’s knowing when to be the hero, and making everything all better, and when to allow natural consequences to be the teacher. There are often times when I throw my hands in the air, wondering if I’m doing anything right, and trust me, this isn’t a perfect system. But I remind myself, that this parenting gig is a long term thing. I’ll leave this post with a cute conversations with my almost 12 year old. She is in year 7, and she has an iPad for school, and so we iMessage each other often. This girl of mine has struggled with organisation in the past, but she is incredible, hard working, insightful, determined, and over the years, I’ve seen her go overcome and go from strength to strength. How do you organise family life? Wonderful advice their. I have 4 girls. Only 2 in school but next year will be 3 in school. So far its ok but might have to adapt some of these later on. Yeah, it’s good to ease into it. It’s taken me a few years of schooling to get myself sorted out. Ha! 1. I make the bits of lunch that can be pre organized a few days at a time and leave them in the fridge ready to stick straight into lunch boxes. Thinks small container of stuff: yoghurt, fruit, veges, chopped up cheese. Then I make a sandwich for each the night before and leave it in the fridge too. Lunch then takes less than a minute to organize in the mornings. 2. We have a job list for each day stuck on the fridge (visual for the youngest). Most jobs needs to be done before breakfast – which uniform and shoes to wear, shoes, hair, sunscreen on – leaving jut teeth and packing bag for afterwards. No toys can come out until all jobs are done. And, Mum can’t be woken up until the pre-breaky jobs are done! Great ideas about the lunches Tierney! Anything to make the morning a bit smoother is a good idea! 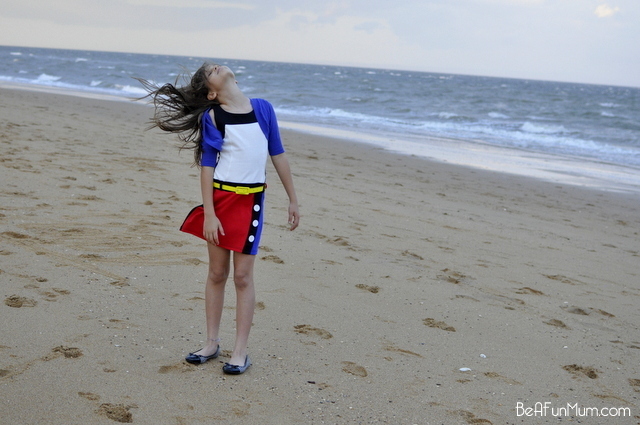 I have 5 children who are all at school now…from kindy to yr 7. I agree with all you say. I also have just 1 basket with all the socks in them…although I don’t even fold them if I can’t find the other one…as long as the kids have the same colour on I don’t really care. They also have sports socks and school socks. Hairband….ugh! I too have a messy draw full of the like. Although they still get lost & the drawer can look pretty empty sometimes. 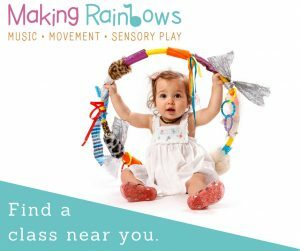 Sounds like you’ve got it all on track – but you need to with lots of kids & if you haven’t worked it out by now you’re probably not going to start lol. Your suggestions are spot on Kelly. I NEED to do the sock marker one, brilliant! 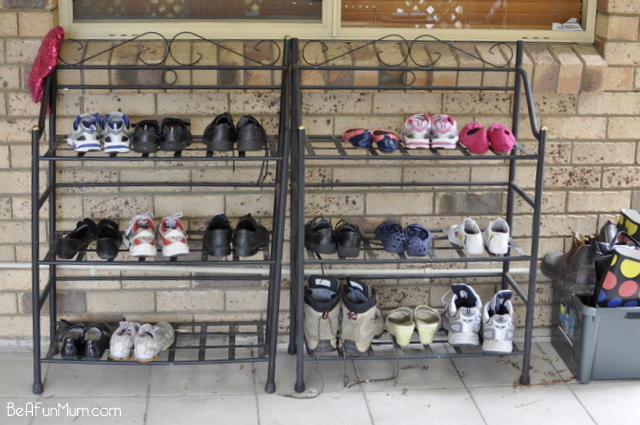 People often comment that it looks like a family of caterpillars live at our house as we have 3 boxes of shoes at the front door 1 for sneakers and closed in shoes, 2 for open shoes/thongs and 3 for gumboots! Ha! I can just picture it! Great ideas! Love the conversation with your daughter – is that normal for girls?????? I would keel over and die if my son in Year 6 called me his beautiful mother – either that or suspect he’d done something wrong and was sucking up lol! I go into raptures of delight if he just lets me sit next to him on the couch without moving five metres away! Yeah my younger boys call me beautiful and I actually think that two of them at least still will when they get older – probably just a personality thing. Love it Kelly, esp the keeping it real parts! we have similar systems too. 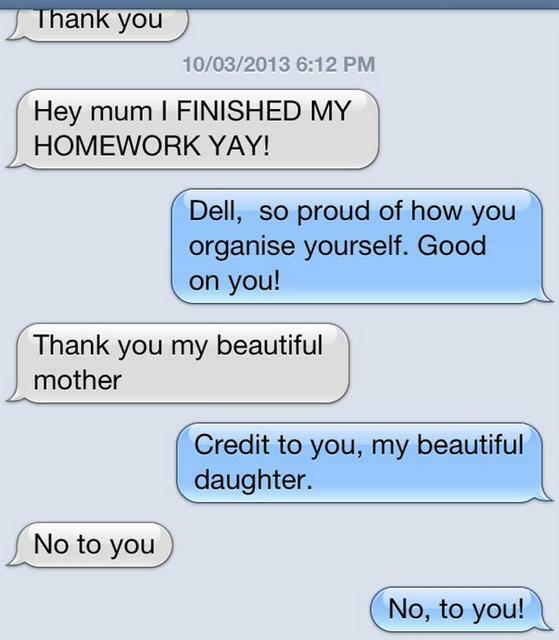 your daughter’s message is so beautiful! makes you feel its worthwhile and gives you energy to take on the next battle ! Very well organised, well done. you go mad if you don’t. My 3 kids all have a colour allocated to them from birth, thanks to my mum. All 14 grand kids know each others colour, it’s quite cute and really helps when at family gatherings, any way I digress! I wash clothes every night, just one load, so I don’t get overwrought with washing as my weekends are just as busy as week nights, it may be whites,darks or colours – whatever needs doing the most. My kids then have their colour coded on their socks but I use their initial , like you do, and I have a wash basket in each of their colours so as I fold, straight into their coloured basket -I never iron, always hang out to minimise creasing and fold to minimise creasing. They then have to put their own clothes away. I don’t care how they do it, they don’t seem fussed if something is creased so why should I? Lunches are made for them by Dad because I hate making lunch :/ the rest they do themselves , have done since Prep. I have never chased their clothes to be washed, if its not where it should be it doesn’t get done! They learn pretty quick. It probably helped that my first son is a rule follower he is now 17 so the other two had a good example to follow. 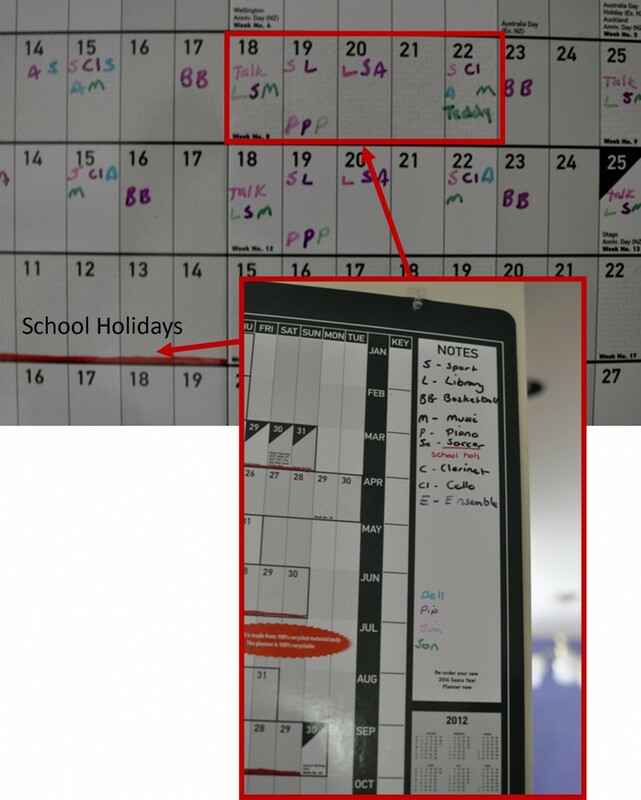 I have 2 magnetised flexible whiteboard weekly calendars I purchased from Melbourne’s Child years ago , one has each child’s daily chores (colour coded) the other has the families schedule ( colour coded) then anything that is a special one off activity is marked in black marker. Works a treat as they on the fridge and freezer, who doesn’t go to the fridge a hundred times a day!! And my iPhone I use they same as you, I was lost the day I left it at home 🙂 didn’t know where I was supposed to be after work and school pick up! Love the coloured coded per child thing you have going on. That’s gorgeous! I love your story, it is so great to have systems with children. The children love it, and it helps for everyone to know what to do. I’m a grandma now, when my children were little I did family day care and often had an extra 4 kids. I had my 3 children in 3 years, and family day care was great. We had a separate play room with lots of tubs for crafts and games, shelves and blackboards. This room worked well. We all loved it. We had systems, (not as good as yours) my children had wash baskets in their rooms. They put their clothes in, and when they were old enough they stripped the bed. They were in charge of their own room. I vacumed once a week ( everything in their room had to be in its place before I could do the vacuming) if the room was a mess I would come in and. “help them,”I would sit on the bed and chat they would do the clean up. I always chose the time when they wanted to go to the park, party, or to their sports. It rarely happened, they knew the consequences of a messy room. They loved their rooms and understood the system. I did a lot of driving around to sports, ballet and music after school. We had a jobs roster on the wall. Empty the dish washer, set table, and feed cat and dog everyone had their job each night. They all took the dishes to the sink, and put dishes in the dishwasher. Everyone had to work as a team. It was a bit of work introducing systems, , but when the children understood how things work in the family they loved it. My children are now grown up and in their 40 s I love to see them and the systems they have with their children. I’m sure children love to live this way as living in chaos is not at all pretty! Just made the kids a command centre (Google it, it’s awesome). So they can be more responsible for their own stuff. Like it when you said, if you take care of that, I will take care of washing and lunch boxes. From age 7 I was taught to wash the socks and undies I had worn that day, in the shower each night. That way I had a clean pair for each day, as I did not have a new pair for each day either. Have taught my kids to do the same.